Pumping up to 98 l/min at pressures up to 345 bar, the Hydra-Cell T8030 boasts a unique diaphragm design that handles more abrasives with less wear than gear, screw or plunger pumps, Wanner claims. It can operate with a closed or blocked suction line and can run dry indefinitely without damage, eliminating downtime and repair costs. With three hydraulically balanced diaphragms in a single pump head, designed to handle high pressures with low stress, the T8030 is energy efficient and has a lower energy requirement that similarly rated centrifugal pumps. Designed for long life with minimal maintenance, the compact design and double ended shaft provide a variety of installation options. The design also enables maintenance of valves and diaphragms to be undertaken easily in the field, without the need for heavy lifting capabilities. 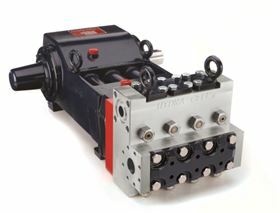 The Hydra-Cell T8030 is available with a choice of Nickel Aluminium Bronze or 316L Stainless steel pump head materials. The pump can also be configured to meet the requirements of API 674 if required. Hydra-Cell pumps are used for liquid transfer, metering, injection, spraying and dosing of a wide range of liquids, including chemicals, solvents, acids, hydrocarbons, natural gas liquids, alkalis, polymers, aqueous ammonia, resins, and slurries.